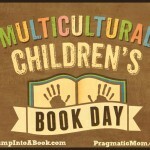 Multicultural Children’s Book Day is January 27! 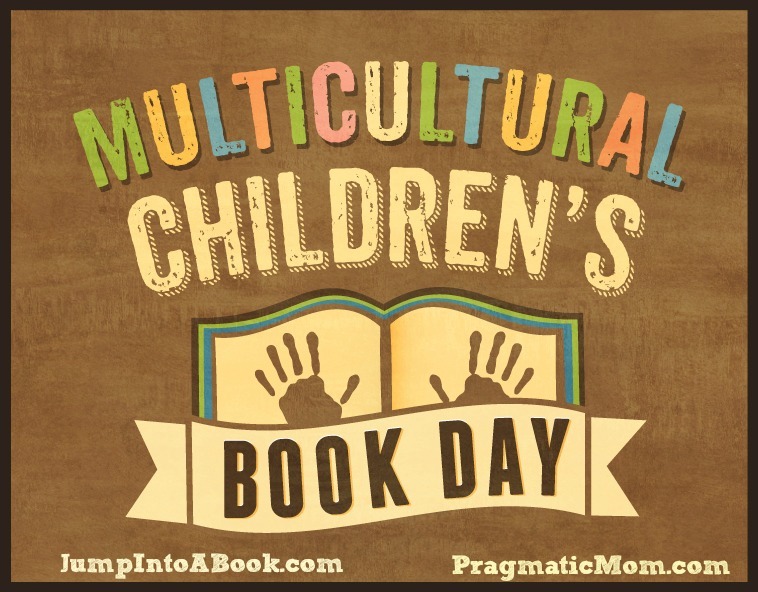 Spearheaded by Valarie Budayr from Jump Into a Book and Mia Wenjen from Pragmatic Mom, MCCBD is intended to “raise awareness of kid’s books that celebrate diversity and get more of those books into classrooms and libraries.” Visit the site to learn more. I came up with a selection of titles from my school library that are perfect for this project, and I used Thinglink to add links to additional resources for the books and authors. Just hover over the book covers to see and click the links! What books would you add to this collection? Please share in the comments! I posted earlier on this blog about using ThingLink to curate resources for the poetry books in my library. 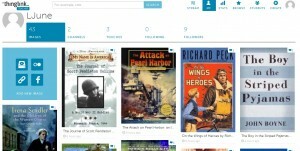 Screenshot of my ThingLink WWII channel. 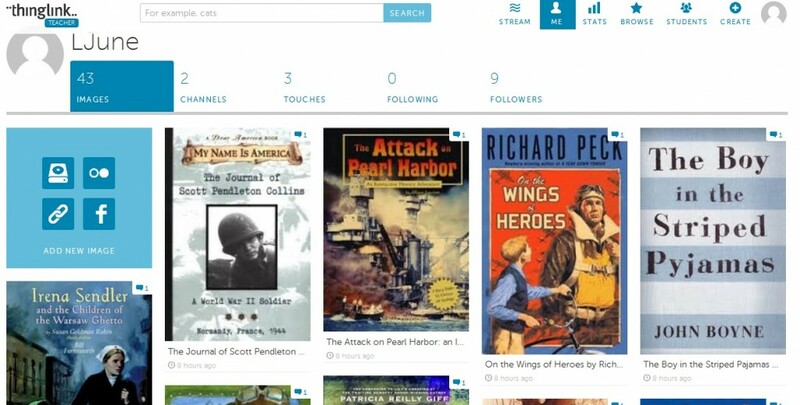 Over the weekend I added a new “Channel” to my ThingLink account for World War II books from my library. Our 5th grade teachers are covering WWII in social studies, and I wanted to share links to lesson plans and discussion guides. All the images are set to Public so you can view and use the resources I’ve collected for each book. I’ve enabled the editing rights as well, so if you have a good resource for any of these books please share your links! Here’s an example of a ThingLink-ed image. I uploaded a photo of the book cover, then added the links you see near the lower left of the picture when you hover over it with your mouse. Just click the link to access the resource! Are you using ThingLink yet? I was just introduced to it a few weeks ago by @AuntyTech on Twitter, and I quickly realized that it was the perfect free tool for my new poetry project! I want to make it easy for teachers to use poetry books from our library in the classroom, and since I know they don’t have a lot of extra time to search for lesson plans and extension ideas, I’m happy to do it for them. ThingLink works well for this because I can upload a photo of each book cover, provide a summary in the comment section, and add unlimited links (to lesson plans, author interviews, book trailer videos, printables, etc) to the image. 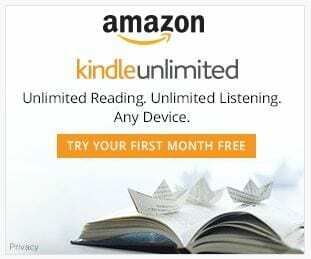 This allows teachers to quickly choose the perfect book for their classroom and put together an entire lesson plan without spending precious planning time surfing the web for resources. I’ve included some sample images here, complete with links, to give you an idea of how ThingLink works. (Just hover over the image to see the links.) I love that the images can be embedded in a blog, wiki, or webpage, as well as shared via the most popular social media sites. You can choose from an assortment of link icons, and you can add a brief description of each link. You can visit my Thinglink Channel to see all the books I’ve curated so far. All of my images are set to be “re-mixable” which means anyone can grab an image and edit the links for your own use. I have also enabled editing on each book photo, so if you have created a lesson for any of these books, or you know of a good internet resource that I missed, please add it! My goal is to upload all of the poetry books that I have in my school library by the end of the month, so you may want to follow me on ThingLink to see when I’ve added new photos. I’ll also be encouraging my teachers to share their own lesson plans for these books, so I’ll be adding more links to existing titles as well. If you’re using ThingLink yourself, please leave a comment to share what you’re doing and give us a link to your Channel!